I have fun news to share! There is a beautiful, new magazine debuting right now from the talented folks at Stampington & Company! 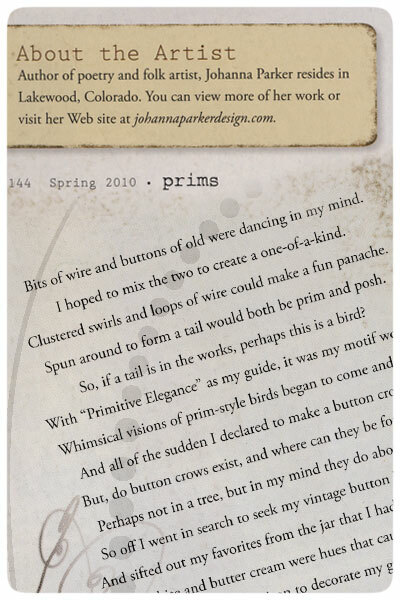 It's called Prims, and features art inspired by a bygone era. Last fall, their managing editor contacted me and asked if I would like to submit a piece that encompassed the look of primitive elegance. Thrilled at the challenge, I said yes! What resulted was a fun character that I named Crowster Buttonbird. After he came to life, I wrote a whimsical poem depicting his personification and they published that too! 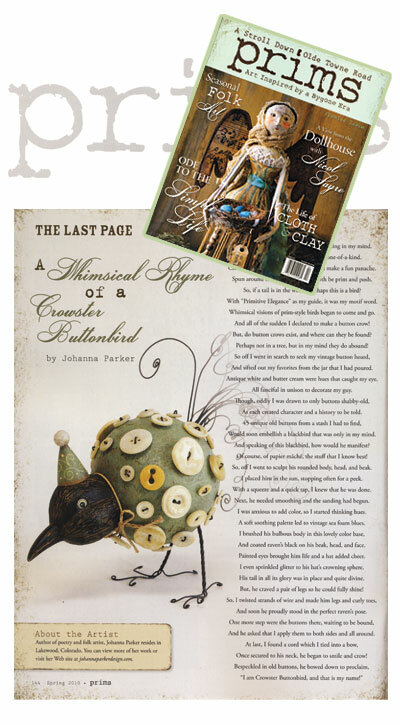 I am very grateful to have my folk art and poetry included within this premier issue! . . . . . . . Here's a peek at my feature which can be found on the Last Page of Prims! (It's easy to find for me as I oddly flip from back to front with every magazine I pick up... Anyone else do this? ) I must say, this is a beautiful publication. 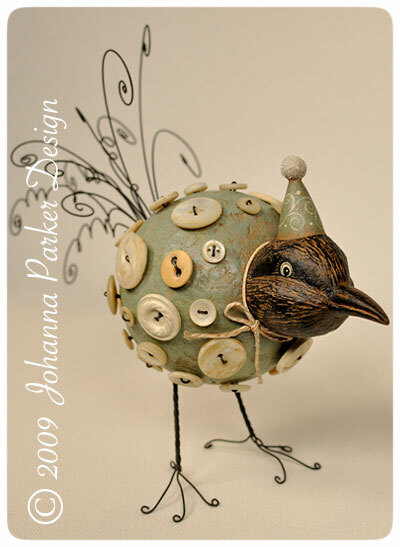 There are many wonderful works of art by fellow folk artists, and each creation is lovingly presented in a way that spotlights each creator's masterwork. It reminds me of an inspirational walk through a gallery. See for yourself, and order your copy today!